Not sure what to do with used cooking oil and grease? Thinking of frying a turkey for the holidays? Never pour cooking fats, oil or grease down the drain, as they can clog your plumbing, create blockages in our sewer system and potentially enter our waterways. Residents of Marin County, except Novato, can bring used cooking oil—in liquid form only—to the Marin Household Hazardous Waste Facility in San Rafael. In some communities, small amounts can be added to your green cart, check with your hauler to verify. For Novato residents, if you have a small amount – a few ounces – of cooking oil, you can pour kitty litter or some type of absorbent into the oil, double-bag it and place it in the trash. If you have a large amount of cooking oil, check with your local restaurants who may have clean liquid cooking oil hauled away for use in production of biodiesel. They will often accept your clean cooking oil. For grease that is solidified, collect it in a can, or wipe out pots with paper towels and put it in the garbage. Click here for more information. 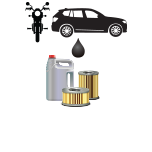 Searching for someone to take your used oil or grease away? Find a list of businesses here. Please note that Zero Waste Marin does not endorse any of these vendors, this list is simply offered as a resource. Food Handling Facilities can find great information on how to properly manage grease and oil at your business by visiting the County of Marin’s Business Resources webpage.